Looking over the edge of a boat, it would be easy to mistake the jewel-toned waters for the Caribbean Sea. But you are more likely to find geoducks and barnacles than you are to find grouper and white sandy beaches. In the Pacific Northwest, the water does not usually look like this. 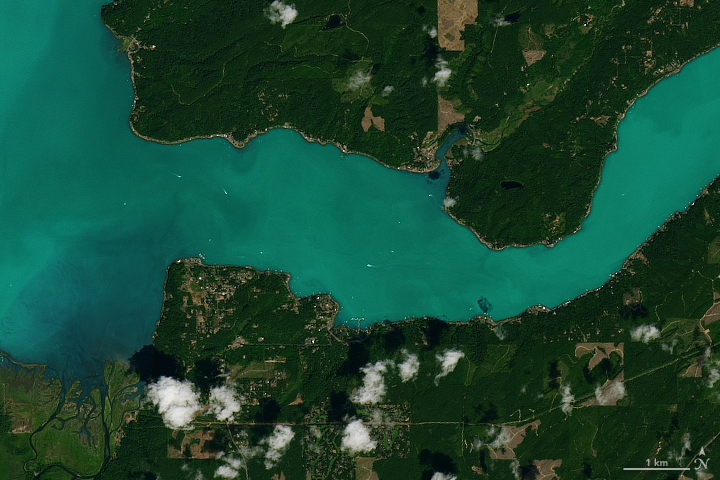 The water in Washington’s Hood Canal also took on a milky blue hue in the summer of 2016. But otherwise, it has been a decade since the fjord appeared this way. 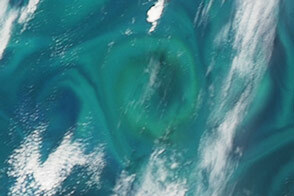 The source of discoloration is a huge bloom of microscopic phytoplankton plated with white calcium carbonate. Under the right conditions, these coccolithophores flourish to such an extent that they are easily visible from space. 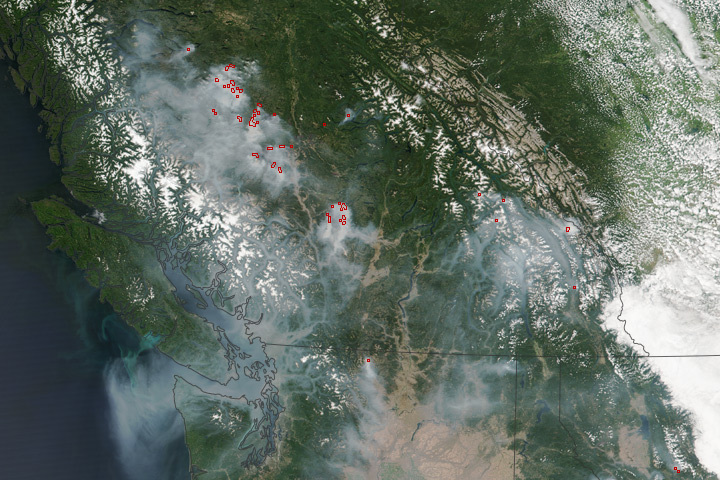 The Moderate Resolution Imaging Spectroradiometer (MODIS) on NASA’s Terra satellite captured the top image on July 31, 2017. This wide view shows the extent of the bloom visible at the water’s surface. 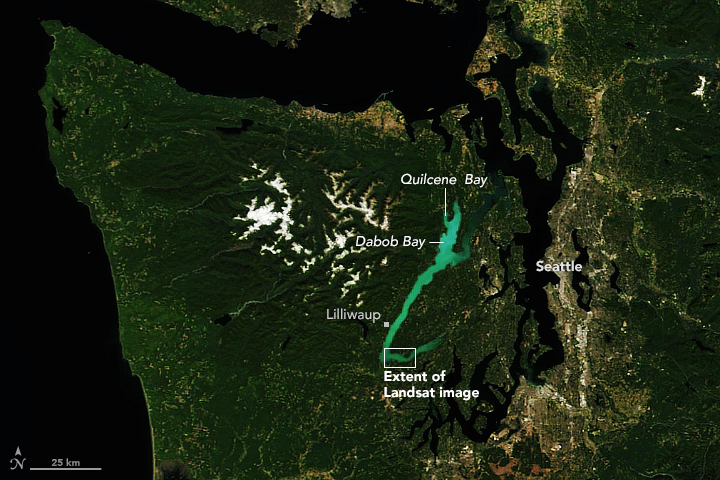 The Operational Land Imager (OLI) on the Landsat 8 satellite captured the other image on July 30, 2017. This detailed view shows how the bloom moves with motion of the water. Notice how it pulls away from the shore near the Skokomish River, where fresh water enters Hood Canal. 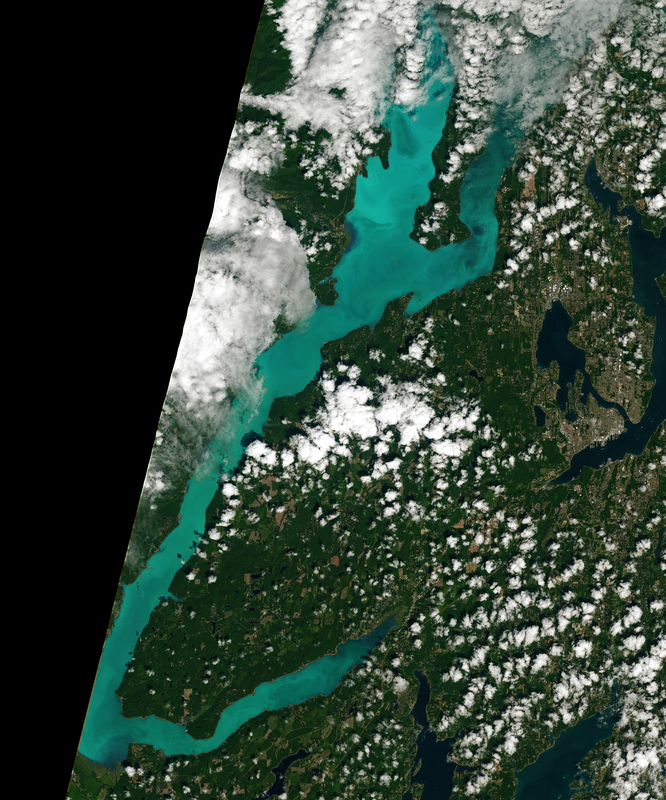 Between 2007 and 2016, coccolithophore blooms were absent from the region. King notes that the likely cause of the recent bloom is Hood Canal’s warm, stratified waters with limited nutrients. 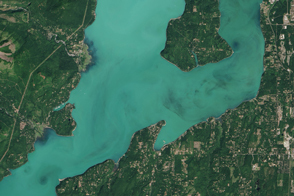 Water in Hood Canal does not always mix well, meaning the upper layer of water can have different temperature and salinity from deeper layers. Other phytoplankton species could have been limited by the poor nutrient conditions, under which coccolithophore blooms can do quite well. Lyndsey Guild, of the SoundToxins program, collected samples from the Hood Canal Marina. Those samples were analyzed by staff at NOAA’s Northwest Fisheries Science Center, who confirmed the coccolithophore species to be Emiliania huxleyi. This species does not pose a concern for swimmers, nor for the consumption of fish or shellfish. NASA Earth Observatory images by Joshua Stevens, using MODIS data from LANCE/EOSDIS Rapid Response and Landsat data from the U.S. Geological Survey. Story by Kathryn Hansen. 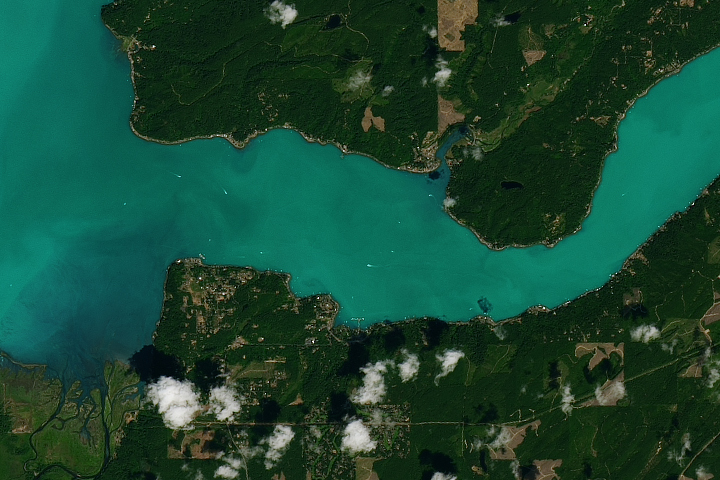 Water in this Pacific Northwest fjord resembles the color of the Caribbean Sea. Facebook (2017, July 30) Bivalves for Clean Water. Accessed August 2, 2017. 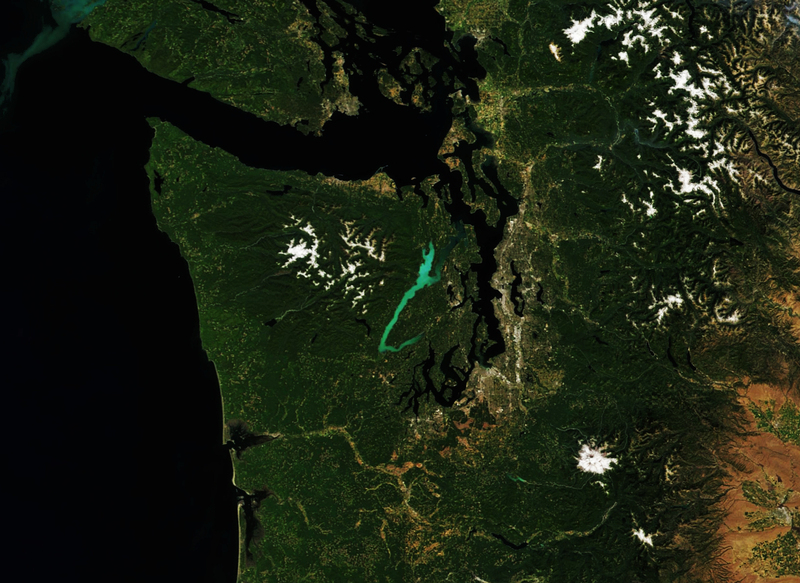 NASA Earth Observatory (2016, July 29) Bloom in Hood Canal, Washington. NOAA’s Northwest Fisheries Science Center (2017) SoundToxins Accessed August 2, 2017. University of Washington (2017) Washington Sea Grant. Accessed August 2, 2017.